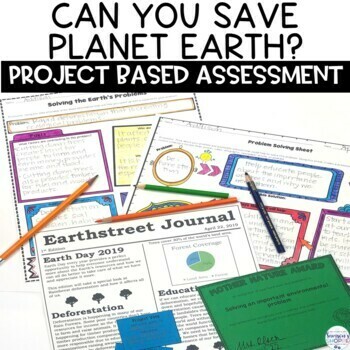 Celebrate Earth Day or any day with this project-based assessment inquiry activity. Your students will use the provided links to research one of the five major environmental problems our planet is facing. Working independently or collaboratively, students will use their findings to come up with a solution. Students will choose one of six ways to present their findings which will be assessed using a rubric. The class winner will win the Mother Nature award for their hard work and dedication to saving our world. → Powerpoint presentation to introduce to your class. 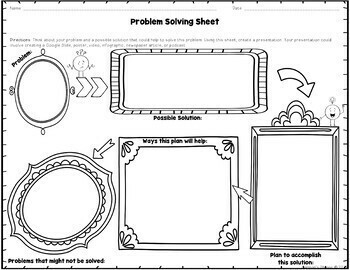 Also includes background information, links for students to use to research each of the five problems, and access to a digital notes sheet. 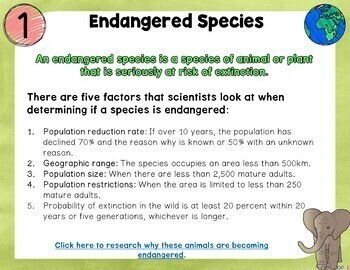 This resource was designed to give students a better understanding of the problems our planet is facing. 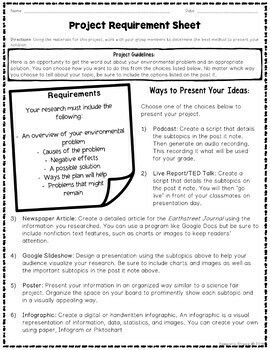 In addition to working on inquiry skills, this resource may inspire students to become activists to help save our planet. This is great! I love how there are options for my kids. Can't wait to use it! This was a thorough and easy to use resource! I love the many opportunities for student choice. Thank you!